Simultaneous Localization and Mapping (SLAM) Technology Market size was estimated to be over USD 56 million in 2017 and is anticipated to grow at a CAGR of over 71% from 2018 to 2024. The simultaneous localization and mapping technology market is driven by the growing complexities in mapping, keeping track of the users’ location along with simultaneously updating the surrounding map. Landmark characterization, nonlinearity, and data association are the various issues faced for achieving a robust and practical SLAM implementation. Over the last decade, a rapid progress has been made in this field to overcome the challenges by developing some compelling applications of SLAM methods. The SLAM technology enables mobile robots to build a map of their surroundings and use the same map to compute their location, accelerating the adoption rates. 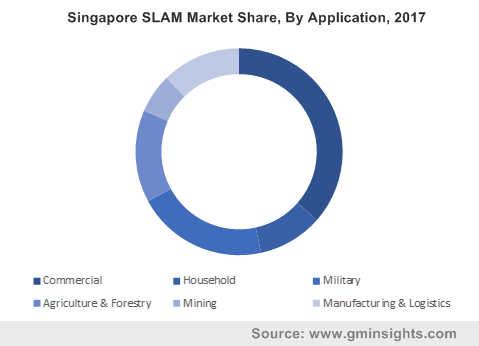 The rapid growth in the use of SLAM technology from various industries, mainly autonomous vehicles and augmented virtual reality, has resulted in its expansion across the globe. Various companies are entering into strategic partnerships and collaborations to expand their product offerings with the inclusion of the SLAM technology. For instance, in September 2018, Fieldbit entered into a partnership with InfinityAR for R&D in the AR smart glasses technology. The two companies are jointly working toward developing an integrated solution for the field service industry by integrating InfinityAR’s SLAM and AR software engine with Fieldbit’s platform for remote assistance. This new SLAM-based solution will serve the needs of the field service organizations by using hands-free solutions for viewing the technical information. The adoption of automation is making the industrial functioning more efficient with reduced defects. Automation systems coupled with innovative technologies are being set up in leading industrial sectors including mining, automobile, manufacturing, and military. There is an increasing adoption of 3D machine vision due to a rise in the demand for 3D object monitoring in industrial applications. The introduction of SLAM technology into these systems assists in improving the accuracy of the systems by delivering enhanced solutions. The SLAM technology enables robots to navigate autonomously through the environment, eliminating the problem of localization in unknown environments. Furthermore, with the ongoing research in this field, the SLAM technology will provide enhanced benefits to the industrial solutions, augmenting the entire business functioning. The UAV segment holds a strong position in the simultaneous localization and mapping technology market and is anticipated to achieve a industry revenue of approximately USD 150.1 million by 2024. UAVs have been rapidly used for real-time mapping, monitoring, and assessment activities of numerous applications including surveillance, building inspection, search & rescue operations, aerial photography, precision crop monitoring, and supply of the essentials for disaster management. Although UAVs are receiving a huge adoption in the SLAM technology market, certain issues such as inaccuracy, failure, and instability of perception are hampering their adoption rates. Hence, in situations where GPS is unavailable or tasks that require high accuracy of mapping and localization, robust and accurate SLAM algorithms are adopted. In July 2016, Velodyne LiDAR partnered with Dibotics, aimed at improving drone mapping & mobile robotics. This partnership will enable Dibotics to deliver its consulting services to Velodyne LiDAR’s clients, who require Dibotic’s 3D SLAM software. The robots segment dominates the simultaneous localization and mapping technology market with a industry revenue of USD 53.9 million in 2017 and is projected to reach USD 1,984.9 million by 2024. Various factors responsible for the rising adoption of robots include rising labor cost, a growing aging population, technological innovations, investments in robotics, and the global competition. The robots work mainly in congested environments among people and require high obstacle detection and avoidance capabilities. The adoption of SLAM technology delivers cost-effective and low-powered solutions, making the robots to work effectively in any environment. Hence, with the SLAM technology being integrated into the robots to support different kinds of applications, their demand is expected to rise over the forecast period. The mining segment is growing at the fastest rate in the simultaneous localization and mapping technology market and is projected to grow at a CAGR of 75.0% over the forecast period. The major factors contributing to the growth include a rapid increase in the high level of risk assessment and risk mitigation attained by the inclusion of SLAM technology. Furthermore, most environments involved in mining processes are hazardous and professionals need to operate in enclosed and tight spaces, which can be complex to access. The traditional underground mining techniques prove to be less accurate and slow, giving rise to the usage of SLAM technology for mining processes. The SLAM solutions deliver more robust and reliable surveying techniques by building a highly accurate 3D model of the underground space with a rapid scanning time. The agriculture & forestry segment is growing at a steady pace with a market revenue of USD 7.9 million in 2017. Agriculture vehicles require the knowledge of their surroundings along with locating its position in the map. This can assist various agricultural practices such as crop monitoring and planning & coordination. The use of land & aerial platforms will enable a third dimension to be efficiently added to crop management by using the SLAM technology. This when integrated with AR systems will provide monitoring capabilities to the individual plant scales, leading to improved prediction of future plant growth patterns. Europe held around 29.4% of the market share in 2017 in the global SLAM technology market. The major features contributing to the growth in this region include the rising adoption of robots and UAVs in a magnitude of applications across the region. The deployment of user-friendly automation and technological advancements in the robotics field also contribute to the simultaneous localization and mapping technology market growth. This region also showcases various growth opportunities, leading to global companies expanding their businesses in this region. For instance, in January 2018, Lyft opened its office in Germany and it was the company’s first official European expansion. This hub will focus on developing self-driving cars using the SLAM technology. The Asia Pacific simultaneous localization and mapping technology market is growing at the fastest pace and is projected to grow at a CAGR of 80.2% over the forecast timeline. 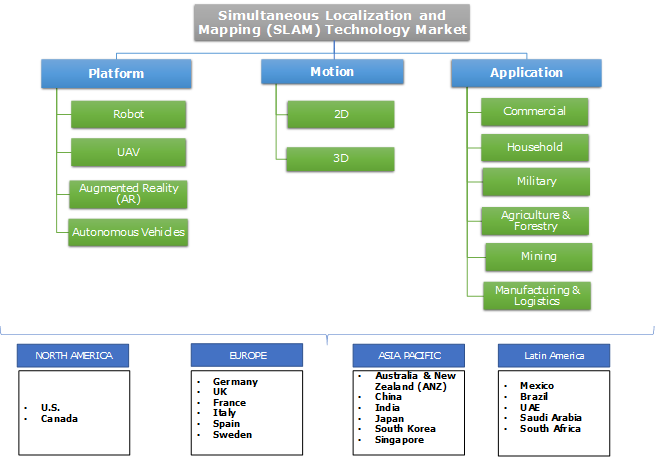 The major factors driving the simultaneous localization and mapping technology market growth in this region include the growing demand for automation, mainly in the manufacturing sector. Moreover, the growth of smart devices along with the rising demand for enhanced features has also propelled the market growth. China dominates the Asia Pacific SLAM technology market, followed by Japan and South Korea. The global simultaneous localization and mapping technology market is categorized by the existence of a large number of innovation leaders and technology providers. Various companies operating in this market have adopted strategic alliances and frequent acquisitions as their key strategies to expand their industry presence. Some of the leading vendors functioning in the SLAM technology market are Kuka AG, SMP Robotics, Google, Apple, Facebook, Parrot SA, Microsoft Corporation, Wikitude, NavVis, Aethon, Fetch Robotics, Clearpath Robotics, GeoSLAM, Kudan, Artisense Corporation, Inkonova, and Ascending Technologies GmbH. The rising adoption of SLAM technology has provided huge benefits to organizations in terms of mapping in unknown environments and delivering enhanced information to the users. SLAM is also being considered as a potential technology in the outer space and is being used for navigation purpose on the MARS assisting the simultaneous localization and mapping (SLAM) technology market to grow at a significant rate. Further research in this field will unveil advanced solutions, providing manufacturers with improved productivity avoiding delay in supply-lead and production turnaround times.